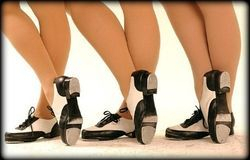 We are not running adult tap classes at the moment, as we are looking for a new teacher . If you are a qualified tap teacher looking for work please contact me. Welcome to the Adult Tap page. The class is a very relaxed and fun class with brilliant musicality as well as a lovely social side. We have a number of routines from many years ago often used as warm ups before learning our current routine which is enjoyable to learn together. The music ranges from lots of musical songs from Mack and Mabel, Chicago plus many more, as well as some more recent pop music too, learning different styles of tap with the music and different steps we thought may never have been possible! The routines (old and new) are accessible to all - from the very beginners to the very experienced, and no matter what, my aim is for you to enjoy the class!! As much as the class has a very relaxed and friendly approach we do work hard and love getting to the end of a routine so we can move onto the next one! With tap being such a historical way of expressing yourself and having fun, it is always nice to look back and think of the legends of tap dancing such as Sammy Davis Jr, Gene Kelly, Fred Astaire and of course Ginger Rogers. These historical dancers are the inspiration of our routines and choreography today. If you are interested but perhaps a little shy feel free to contact me on the form below. I look forward to seeing you and getting those feet moving! © 2018 Freestyle Dance Company (Kent). All Rights Reserved.